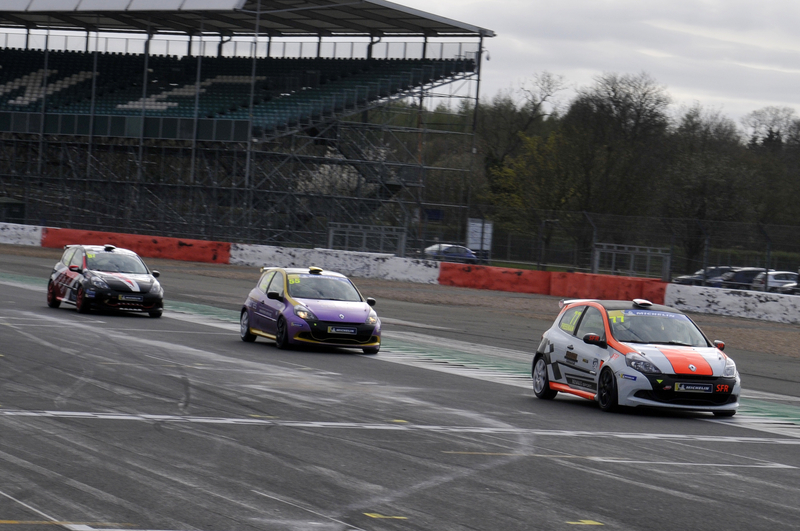 Pitbull Racing’s Simon Freeman took his maiden victory in the Michelin Clio Cup Series in the final contest at Silverstone International, courtesy of a late pass on Luke Pinder. Pinder – who won this morning and led initially despite a delayed start as Nic Harrison suffered a mechanical failure on the grid – led from the start and looked on course for a double win, until a late move down the Hangar Straight on the penultimate lap gave Freeman the lead. He duly took the chequered flag 0.833 seconds clear, and with the fastest lap for good measure he also assumes the lead of the Race Series standings. Both were kept honest, however, by the Westbourne Motorsport machine of Paul Bell. The Scot made a strong start to pass team-mate Ronan Pearson for third into Abbey and kept at close quarters throughout. Though the #87 looked a threat, the battle between Freeman and Pinder ultimately didn’t provide an opportunity for Bell to pounce – regardless he will be satisfied with a maiden podium finish in the category. Pearson rounded out a solid season-opener in fourth, with Verhulst fifth and Joannou sixth after a drive-through penalty. James Colburn was victorious once again in the Sport Series stakes, fending off MRM’s Tyler Lidsey for the duration of the 16-lap contest to win by 2.869s and defend his new record of being the only man to win a race in all three of the championship’s classes. Ambrogio Perfetti continued his strong showing to finish third, ahead of Patrick Kibble, Richard Guy and Harriet Guy. In the Road Series, Westbourne Motorsport’s Richard Colburn was victorious after the aforementioned dramas for Jade Developments racer Harrison on the grid, meaning the duo are level on points heading to Brands Hatch. Colburn couldn’t afford to relax, however, with a positive end to the weekend for Darren Geeraerts as he equalled his best-ever finish in second. The championship heads next to Brands Hatch over the weekend of 11-12 May.